This is not a dissimilar consideration that my colleague Mark Durie and I discussed as we drove nearly two thousand kilometres around regional New South Wales to engage with educational outreach, meeting special education teachers and mainstream teachers with significant special education needs in their classrooms. We are particularly lucky in our school to have a significant number of experienced and innovative educators to reach out to and seek ideas and collaboration from, and while in Australia educators mostly have access to social media and related resources to engage in dialogues with a host of excellent teachers, there is still little substitute for direct collegial engagement with consideration to the gap that is experienced when this is not available, particularly in relation to your field of practice. After recently discussing plans for a new style of professional collaboration with a colleague in a Scottish school for young people with autism, I have some renewed ideas for ways of engaging this need in rural and remote parts of our country with particular focus on special educators, which I’m currently building into my PhD and I’ll look forward to sharing in more detail shortly. Mark and I recorded a daily video diary while we were on our regional Road Warrior trip around the state, and before this I was maintaining another daily video project called ‘V.I.D.E.O’ - Visual Instruction and Direct Executive Operations - a way for me to focus on a new visual teaching strategy as it relates to autism pedagogy, and to share it through brief fifteen second video snippets. You can see where I am up to so far on the Instagram page for the project. One of the focus points I’ll be addressing next in the project are the different ways in which we approach visual teaching strategies through different key learning areas, such as numeracy. The underlying abstractions of primary school mathematical concepts are often very challenging for our students on the spectrum, as they find it difficult to visualise the processes that are occurring within these concepts. Of course, the clichè is that autism and mathematics are a natural package, and while there are particular strengths relating to sequencing and logical processes that our students can often demonstrate, the more advanced, more abstract processes often prove a significant difficulty. In this regard, I am a huge fan of resources that can visualise these concepts for our students - take for example, the incredible mathematical gifs that LucasVB creates, hosted in this Wikipedia Gallery, as well as the mathematical beauty represented on the Bees and Bombs tumblr. Two other numeracy resources we’re using a lot in the classroom currently on our iPads are two apps, one that is brand new this month, by the husband and wife educator duo at Top Storey Apps. The first is Math Shake, an app that uniquely allows you to work with students on understanding how to interpret mathematical problems that are expressed through words, rather than those composed of simple equations. For example, a word problem put to a student might be, “Jo and Casey read 6 books altogether. If Jo read 3 books, how many did Casey read”, or, “If Kahu has 6 bananas to share with her 4 friends, how many bananas will each friend get?”. Using Math Shake, the app guides you through the process of decoding word problems so students can break down the elements of a word problem with guidance from friendly little characters on screen - a cowboy pencil that lassos the numbers that you need to think about, a microscope wielding pencil that helps you identify the word in the problem that established the operator that you will use with the numbers in the problem - which, as you work through the word problem, you end up with a simple equation that identifies the process you need to solve to find the solution. Then, a clean whiteboard environment opens up with a host of mathematical concrete tools, such as little buttons, number lines, tables, charts, pencils and related, to help you work out the solution now you have the equation established. The app lets you know if you have solved the equation correctly and explains how it could have been solved. It also allows students to record the whiteboard environment as they work on solving the equation, and can also record microphone input for students to speak aloud as they solve the problem in order to review the process by which the student solved the equation later, and to provide feedback at this time. It is a remarkably clever way of helping our students to decode word problems and visualise the process of solving the equations hidden within - you can read more about Math Shake on its website. The second app, brand new from Top Storey Apps, is Times Table Galaxy. The focus of Times Table Galaxy is to provide an engaging platform for students to practice multiplication skills and recall times table facts, with two unique features that we have been really enjoying while testing the app this past week. The first is the ability to challenge classmates through Game Center (and by classmates, I’m also including teachers in the mix! ), where you can see who has scored the quickest times for particular multiplication sets. Competition is one of those double edge sword elements of the classroom - some students absolutely love it, and some students shy away from it. In this way, Times Table Galaxy allows students to select what they are most comfortable with - students who don’t enjoy the competitive nature of activities like this can just enjoy the app in a solo manner, while students who thrive off the healthy competition of activities like this absolutely love trying to best each others times with the Game Centre connection. It’s a really terrific feature. Related is a timer feature that can be turned on or off, particularly again for students who don’t need the pressure of working towards a best time in the game, who can then turn the timer on when they feel confident in taking on the challenge of working towards their own personal best times. The other feature that is excellent is the ability to screen and microphone record your sessions, similar to the one described above in Math Shake. Students can record their multiplication challenge sessions, racing through the galaxy solving times table facts, all the while recording what they’re doing on the screen, and recording themselves speaking aloud to consider the way they’re verbalising the process. These recordings can then of course by shared with the class, can be saved as a student work sample to be evaluated with feedback from the teacher, and can be used as an evaluative work sample of discussion when providing feedback to family on outcomes related to numeracy. The graphics are beautifully designed, with no ads, and the whole interface is intuitive and ready for classroom implementation. I’m a big fan, check out the Times Table Galaxy website for more info. In #MakerEd related activity, with links to some new therapy focus points we’ve been working with, we had a tremendous teacher meeting session the other afternoon where some of our talented occupational and speech therapists demonstrated work they’ve been doing recently with Lego Therapy. The goal of Lego Therapy is to develop social communication and social skills in students who require assistance in these areas, using a simple process of Lego building collaboration between three students, as facilitated by a therapist or educator. One student is the architect, looking at a visual of what blocks are required for the construction task and describing the next blocks required, the second student is the resource manager who holds the collection of Lego bricks required for the project, who is tasked with finding the particular bricks as described by the architect and passing them to the third student, who is the builder who actually puts the bricks together. The process of architect describing the bricks required, the resource manager finding the bricks, and passing them to builder to construct, is such a simple but incredibly effective method of developing social language, collaboration, problem solving, and so many other beneficial social outcomes in our children. Inspired by this, and thinking about work done in Lego robotics spaces, I’ve become interested in establishing Lego Robot Therapy sessions that take the same principle as the basic Lego Therapy process, but with a focus on creating Lego robots that can be programmed with iPads to solve tasks set to students. The same roles will apply for the process of putting the robots together, but with additional role applications to be taken up by the students for the programming and problem solving elements of the session. The focus group here are our students on the spectrum who are inspired to engage with the robotics and coding elements of Lego, in a structured session with a focus on building the social communication and collaboration dynamic between peers. 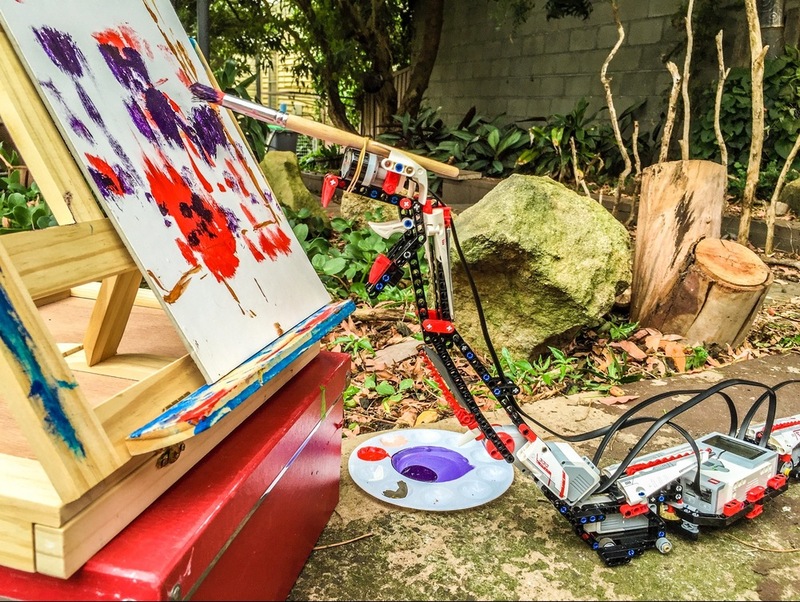 As a weekend experiment with Lego robotics, as I’d not yet used the Lego Mindstorms EV3 system, I decided to put to task at creating some robot art, always one of my favourite uses for new robots. I’d like to task students with creating unique artist robots to create artworks as part of Lego Robot Therapy sessions. I’ll be sure to share the results when they’re in. Our other #MakerEd activity recently that I was able to recently demonstrate at the ‘Make Learning Better’ conference hosted by Mark Oliphant College in Adelaide, is the Virtual Minecraft Machine (VMM) that I designed after being inspired by a fantastic exhibition on Minecraft related activities at the Sydney Powerhouse Museum last school holidays. The VMM involves using a MaKey MaKey hooked up to Minecraft on computer, with the following inputs: a piece of aluminium foil wrapped around a cardboard floor pad, linked to the keyboard input to make your Minecraft character walk, so when students walk on the aluminium foil floor pad with their feet they make their character on screen walk forward; another aluminium floor pad to trigger either the jump keystroke or the walk backwards keystroke, depending on preference; a Lego constructed controller with Play-Doh keys linked to mouse inputs for looking up, down, left and right, which students use to make their character look around the world; and, the centrepiece, a Lego made pick-axe wrapped in aluminium foil that, when it hits one of two Lego crafting tables wrapped in aluminium foil, allowing our character to either destroy or build depending on the surface you tap with your pick-axe. Check out the video on the Instagram below as to how it works, and check out the Vimeo video below for a three minute tutorial on the construction process. An additional feature I’m looking at adding is a streaming link-up to Google Cardboard, so you could wear Google Cardboard and see the Minecraft world in front of your eyes while you use the materials around you to navigate and interact. Minecraft Controller (MaKey MaKey, Lego, Play-Doh and Foil) from Craig Smith on Vimeo. That’s it for now. In two weeks time I’m heading to Shanghai to present on accessibility and technology at the United Nations ESCAP forum, “Information For All: Workshop on Accessible Knowledge, Information and Communication for Persons with Disabilities in Asia and the Pacific”. I’ll make sure to share my presentations I deliver at the forum, and to provide a summary of the workshops, when I return, just in time for Christmas. I hope everyone has been having a tremendous time as the school year wraps up. Best wishes for transitions into 2016 and to all the potentials that the new year will bring.